When Heidi McNiff Johnson received a phone call in the middle of the night on November 9th, 2002 that her mother had died in a car accident she transcended her grief by finding ways to give back to families in crisis. For Heidi, that meant establishing the Children’s Hospital Spiritual Care Guild with a group of friends, a non-profit that provides chaplains 24 hours a day, 7 days a week to the 150,000 families that come to Children’s Hospital each year. Married to her high school sweetheart, Ron, and the mother of three sons (Hunter 22, Henry 20 and Ford 16) Heidi became the Executive Director of The Association of Catholic Student Councils (TACSC), a Catholic leadership organization whose mission is to develop moral leaders who positively impact our world, in 2013. “What drew me to TACSC is the ability to plant the seed of compassion in our children, teaching children how to lead, how to communicate, to be lifelong mentors – and, more importantly, that you can’t lead unless you serve,” Heidi said. TACSC, which will serve almost 3,000 students this year, currently works with 122 Catholic elementary schools, and works with 31 Catholic high schools in the diocese of Los Angeles, Orange County, San Diego and Phoenix. “It’s a peer-to-peer leadership organization, a little bit like a waterfall,” Heidi explained. Heidi believes her passion for philanthropy initially sparked when she started kindergarten at Mayfield Junior School. A “Mayfield lifer,” she graduated from Mayfield Senior School in 1984, and has served on the school’s board of directors as a trustee and been honored with the Cornelian Award for service. Angela Howell, Director of Development at Mayfield Senior School, said Heidi “epitomizes” the Mayfield motto: actions not words. Much like spreading the Gospel message, Heidi spreads the message that our actions make a difference in the world through Charity Matters, Angela added. “Heidi is one person of Christian action, taking her faith life and putting it out in the real world, and making sure that others have a chance to experience the faith that has been such an important part of her own personal experience, as well as her family and community,” Angela said. 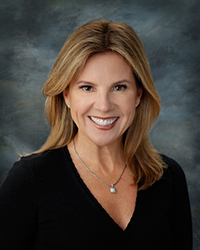 In other endeavors, Heidi is currently on the board of Christ Child Society of Pasadena, Project Giving Kids, a nonprofit that teaches children philanthropy, TCU’s Chancellors board, The Spiritual Care Advisory Board at CHLA and has served as Co-Chair of the Board of Directors for Verbum Dei High School for the past five years.